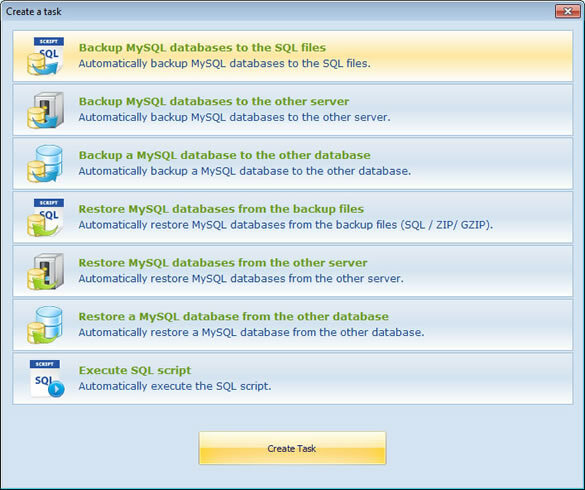 MySQL Backup GUI Application VS. MySQL Enterprise Backup. Automatic Backup Scheduler for MySQL > Tutorials > MySQL Backup GUI Application VS. MySQL Enterprise Backup. 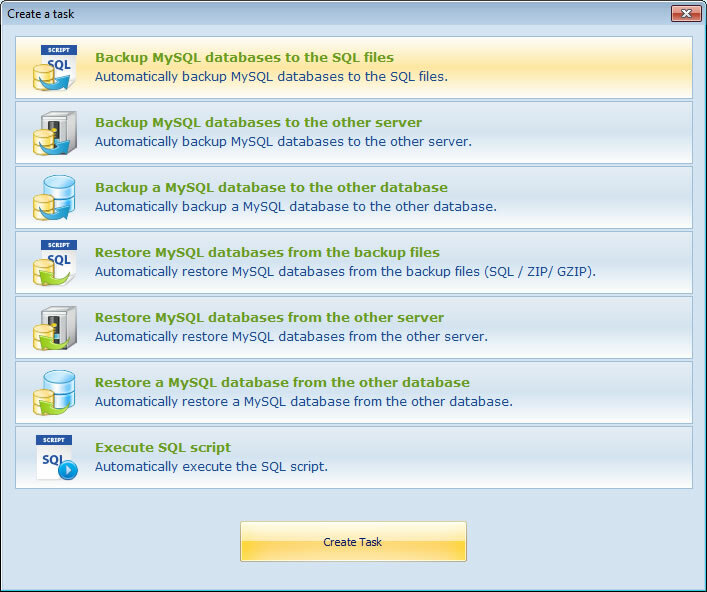 MySQL Enterprise Backup is a MySQL online backup software which developed and supported by Oracle MySQL team. Its function is very powerful, but you need to learn and enter many SQL commands to run it. In fact, you can have a better choice - Automatic Backup Scheduler for MySQL. Automatic Backup Scheduler for MySQL is an easy-to-use and professional automated MySQL backup and recovery software with user friendly GUI. You can use it to back up MySQL database to the SQL files, the other MySQL server or database on schedule. It will automatically compress and password MySQL backup files to ZIP / GZIP archives and upload them to your FTP server and Email box. With Windows Service function, you do not need to log in Windows system for scheduling backing up and restoring. And it also provides MySQL Backup Command Line Program to manually back up or restore MySQL databases. Let's look at the features of Automatic Backup Scheduler for MySQL and Mysql Enterprise Backup.